Engineered with your complete comfort and support in mind, memory foam mattresses. Visco-elastic memory foam was first developed by NASA, and was used to cushion seats in aircraft. Hospitals soon discovered the foam’s ability to keep bedridden patients comfortable, and it wasn’t long before memory foam mattresses made their way to everyday consumers. Whether you suffer from an uncomfortable condition such as arthritis, or if you’re simply in search of the most comfortable mattress available, you’ll find that memory foam provides the support you need – and it’s quite likely that you’ll never go back to old-fashioned mattresses again. Size – Memory foam mattresses come in come in every size, so it’s easy to pick the one that works best for your needs. As with other mattress types, the larger sizes tend to be more expensive than smaller sizes. Composition – What other elements are included in the mattress? Is there a special cooling layer? Does the cover come off for cleaning? How many inches of memory foam are included in the mattress? Weight – Memory foam is heavy, and this means that even the best memory foam mattress may be quite a bit heavier than a traditional innerspring mattress. Know that you might need some help when it comes time to move your new mattress into your bedroom. CertiPUR Certification – Memory foam mattresses made with out PBDE flame retardants, formaldehyde, phthalate, heavy metals, and ozone depleting materials are often CertiPUR Certified. Mattresses that carry this certification have low VOC (Volatile Organic Compound) emissions, contributing to better indoor air quality. Price – Memory foam mattresses used to be prohibitively priced but as with most other forms of technology, costs have dropped drastically. It’s not at all difficult to find a durable, comfortable memory foam mattress for under $1000. Some of the most popular memory foam mattresses may cost less than $500, depending on the size you need. Choosing the best memory foam mattress based on other buyers’ experiences is one of the best ways to avoid problems and enjoy an exceptional experience and get the right amount of sleep each night. We’ve gone to great lengths to provide the best recommendations possible in hope of saving time and effort on your part. Here are ten of the most popular models for your consideration. The Nectar Sleep Memory Foam Mattress features two layers of CertiPUR-US® Certified gel memory foam that contour comfortably to the body while distributing weight evenly and promoting air circulation for better temperature regulation. The adaptive high core memory foam adds a touch of bounce, while the breathing base layer provides reliable stability. A Tencel cooling cover wicks away heat while providing bedbug resistance. Nectar memory foam mattresses come with a 180-night home trial and a “forever” warranty. Nectar’s mattresses are compatible with a variety of bed types including adjustable bases. This mattress offers support on the firmer side of medium-firm, so if you’re looking for a plush feel, you might enjoy another brand better. Those who require ample support are likely to find it suits their needs. The 180-day trial period is among the most generous in this sector, particularly given the affordable price point. 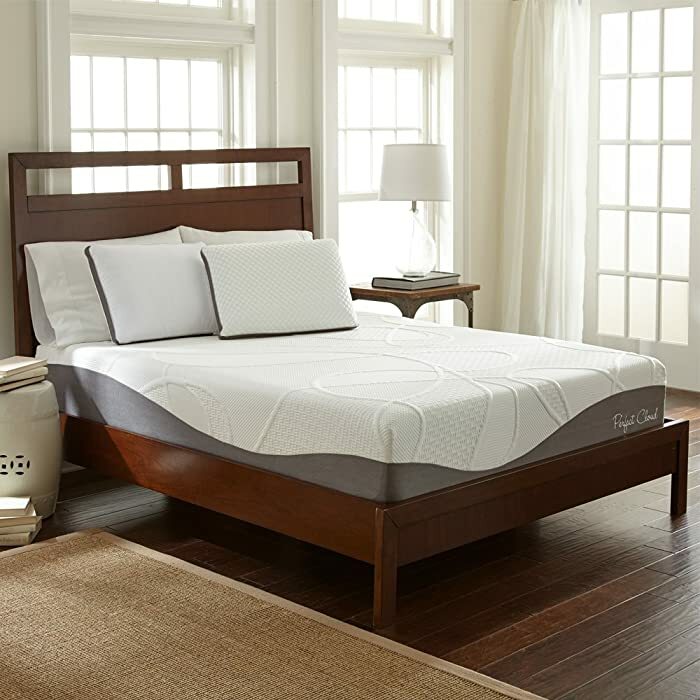 With 8 layers of premium materials including a plush, built-in pillow top in a cozy, tufted cashmere blend for softness and breathability, the DreamCloud memory foam mattress features a supportive five-zone pocket coil system that provides just a touch of bounce. This mattress offers multiple layers of CertiPUR-US certified high-density memory foam designed to ensure comfort for people who sleep in different positions. Gel memory foam helps to wick away heat. DreamCloud mattresses come with a 365-night sleep trial and a robust Everlong warranty against defects in workmanship and materials. Financing and white-glove delivery service are available on request. People who are looking for a medium-soft mattress with luxurious features are likely to enjoy sleeping on the DreamCloud. While a few reviewers felt this mattress was too soft and a few said it was too firm, most people are satisfied, often comparing it to luxury hotel mattresses and brands that cost thousands. While this isn’t the cheapest memory foam mattress we’ve reviewed, it offers an appealing combination of reliable comfort, quality materials, and exceptional value. The warranty and 365-night trial are among the best in the mattress industry. 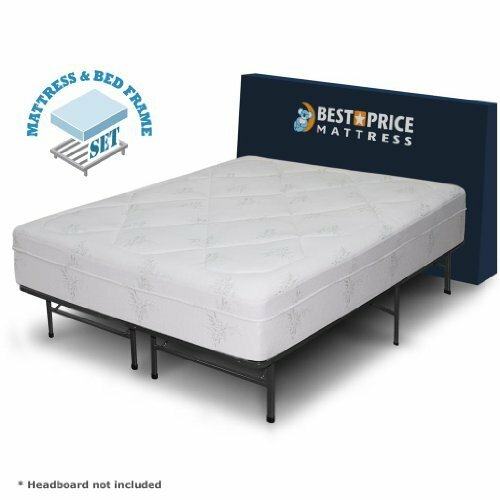 The Best Price Mattress 12” Grand Memory Foam Mattress comes complete with a frame and foundation combination to replace an old frame and eliminate the need to purchase a separate platform. The mattress features three separate layers including 2.5 inches of memory foam, 3 inches of super soft pressure relief foam, and 6.5 inches of high density foam. It is CertiPUR Certified, and comes with a 10-year warranty. If you are looking for a complete memory foam mattress set at an affordable price, then this may be the one for you. Most reviewers are surprised and pleased at the quality and comfort, as well as at the easy setup. 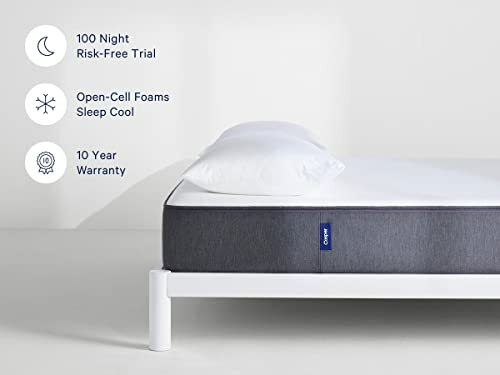 The Casper Sleep memory foam mattress features an open-cell top layer that uses a combination of conduction and convection to eliminate excess heat while providing maximum airflow. Designed to offer medium-firm support and eliminate any pressure points, it features a strong base layer for added durability. A 100-day test period ensure that the mattress is as desired, and a 10-year warranty assures longevity. This mattress takes up to 72 hours to fully expand. If cost isn’t your first consideration and you are looking for a cool memory foam mattress with medium-firm support, then you are likely to appreciate this one from Casper Sleep. Many of its reviewers report sleeping better despite health conditions such as back problems, arthritis. The 100-day test period ensures your comfort, and the 10-year warranty inspires confidence in the manufacturer. 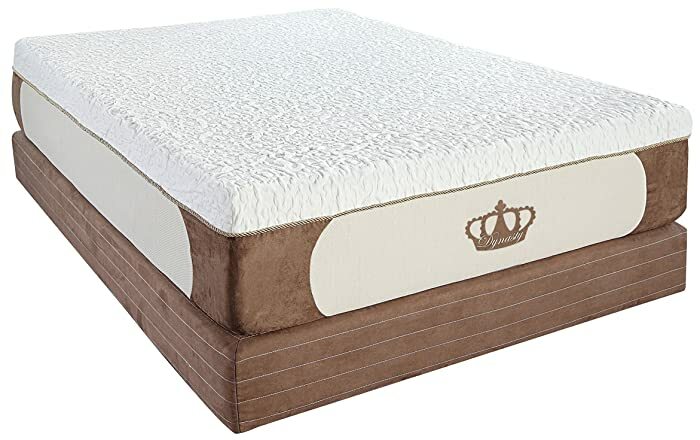 Made with several layers of memory foam to relieve pressure points, this Classic Brands king memory foam mattress features a high-density aerated cool gel top layer that provides a plush sleeping surface while offering ventilation. This mattress boasts a removable stretch-knit cover and is suitable for use with adjustable bases. It is CertiPUR-US certified for performance, emissions, and durability. A 25-year manufacturer’s warranty is included. If you’re looking for an affordable king memory foam mattress, then you’re likely to be pleased with this one. While many reviewers report problems with packaging, they also report that the mattress is very comfortable once unpacked, and often report that aches and pains fade quickly. The DynastyMattress Cool Breeze 12-inch queen memory foam mattress features a three-inch layer of gel memory foam for cooler sleeping, along with two inches of cool airflow foam and a high-density support foam lower layer, plus a washable cover that zips on and off. A 120-day trial period ensures satisfaction, and a 30-year manufacturer’s warranty is included. 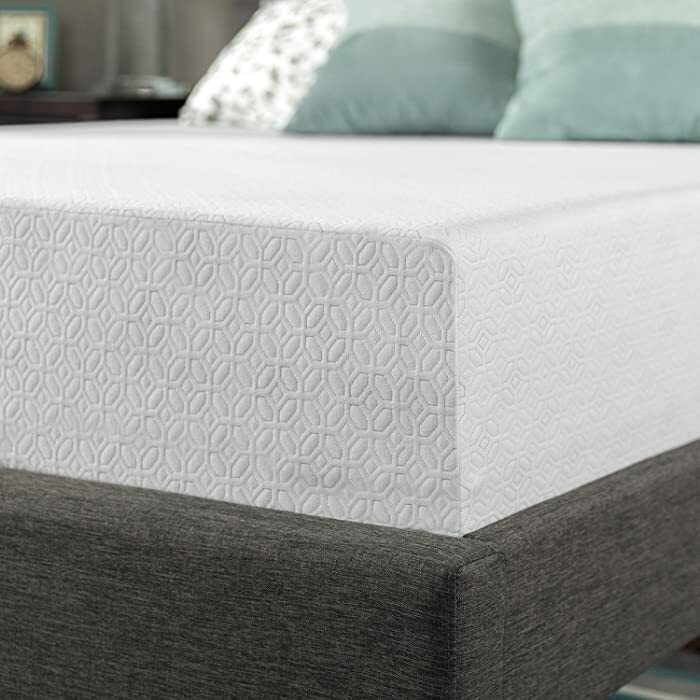 Top is a little less plush than some other brands; some users add a gel memory foam mattress topper for a softer feel. 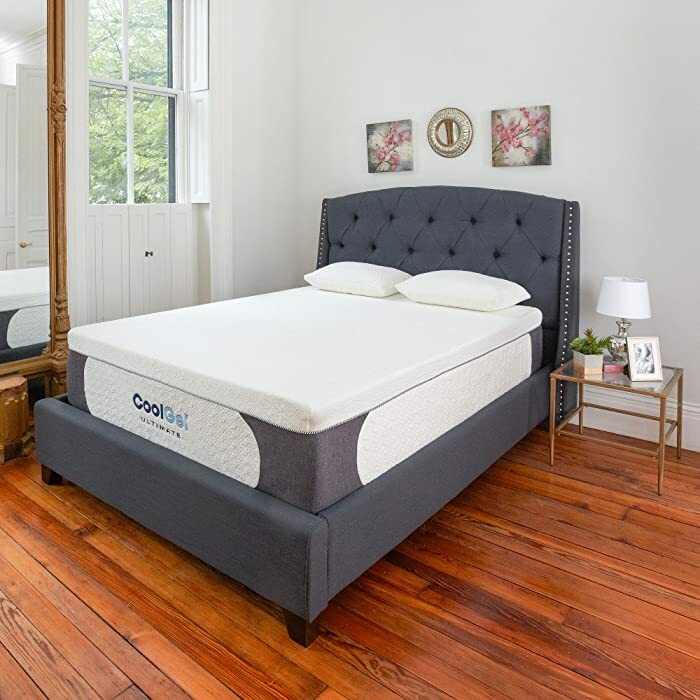 If you need firm support and want a gel memory foam mattress at an affordable price, then you may want to consider this one from DynastyMattress. While many users report that it takes some time to break in, most are satisfied. The 120-day test period and 30-year warranty are a nice bonus for an inexpensive memory foam mattress like this one. 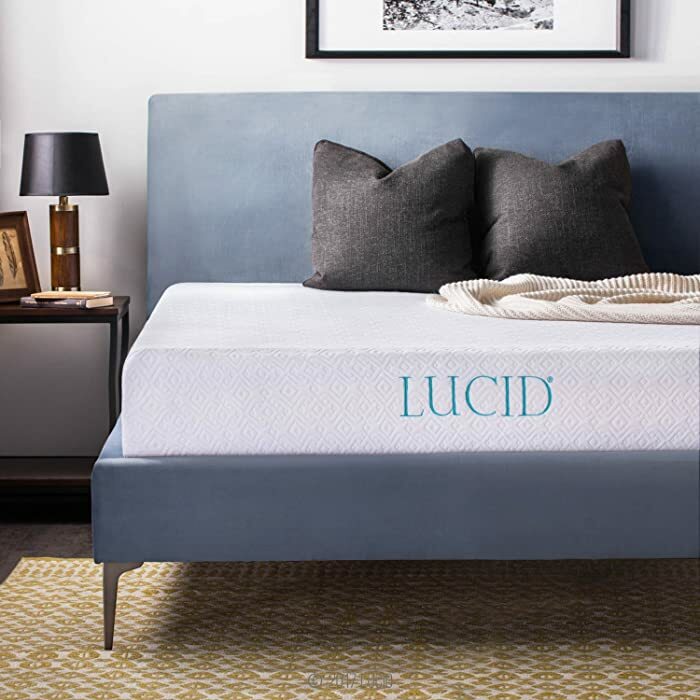 This Lucid 10” memory foam mattress combines an upper layer of gel-infused, ventilated memory foam for good airflow, along with a high density foam base for a supportive, medium-firm feel. The breathable cover features TENCEL-blend fabric for comfortable softness. This memory foam mattress is CertiPUR Certified, and comes with a 25-year warranty. If you are looking for fairly firm support in an inexpensive memory foam mattress, then you are likely to be pleased with this one. If you prefer a mattress that lets you sink in deeply, then you’ll probably prefer something softer. It’s worth noting that some users who found this mattress a bit too firm added a memory foam topper and were pleased with the results. 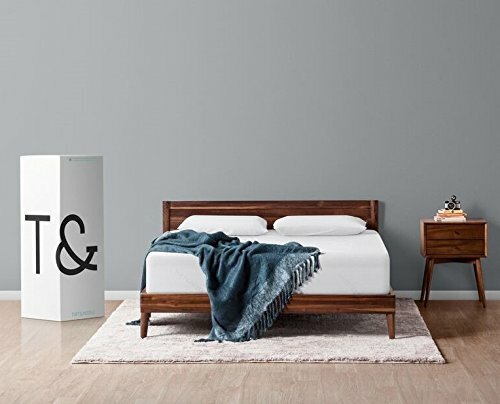 The Perfect Cloud Atlas Gel-Plus queen memory foam mattress features double air flow comfort foam for a cooler night’s sleep, along with a supportive double air flow base made with heavy duty support foam. Designed to provide ample back support while offering just enough softness to allow the hips and shoulders to settle comfortably, it accommodates people between 40 and 400 pounds. The knit cover is removable for easy cleaning, and the mattress is CertiPUR Certified. A 30-day trial period allows users to test the mattress, which is backed by a 10-year warranty. If you’re looking for a thinner memory foam mattress to use with or without a topper, and you’d like to spend a bit less than $500, then this may be a good choice for you especially if you’d rather not invest in deep pocket fitted sheets to accommodate a thicker mattress. As with other memory foam mattresses we’ve reviewed here, most users love it and a few report that it wasn’t the best choice for them. The 30-day trial period allows for testing, and the 10-year warranty means you can return it in the event that you find any defects. The Perfect Cloud king-size Ultraplush Gel-Max memory foam mattress features a two-inch layer of cooling gel-infused memory foam topped with a layer of air-infused memory foam. These two upper layers are supported by a heavy-duty memory foam base. The removable, washable cover features a zipper for a secure fit, and the 10-inch thickness accommodates standard pocket sheets. This memory foam mattress is CertiPUR Certified, and comes with a 30-day test period as well as a 10-year warranty. Some reviewers felt the mattress was too firm, especially for very lightweight people; adding a memory foam mattress topper fixed the issue for some. If you prefer a fairly firm sleeping surface and you’re looking for an affordable king-size memory foam mattress, then you are likely to be pleased with this one. If you prefer a softer mattress, you’re probably better off with a different model; most of the negative reviews address the mattress’s firm feel. This Signature Sleep memory foam mattress features a 3.5-inch memory foam upper layer on top of an 8.5” layer of high-density foam. It is CertiPUR Certified, and is made with eco-friendly components. This memory foam mattress offers firm support. It takes approximately 72 hours to fully expand, and for odor to dissipate. If you’re searching for a cheap memory foam mattress that also offers a good level of support, then you may like this one from Signature Sleep. Some petite users find that it is a bit too supportive; if you are small-statured you might prefer a medium-firm mattress rather than a firm one like this. Many reviewers mention that the cover is not fantastic, and recommend adding a mattress protector for easier cleaning. Made with high-grade, supportive foam with cooling properties and outstanding pressure relief, the Tuft & Needle mattress provides localized “bounce” that keeps movement from disturbing a sleeping partner. This is one of very few mattresses made in America. It comes with a 100-day trial period and a 10-year warranty, and it is CertiPUR Certified. The manufacturer recommends waiting 72 hours for full expansion and odor dissipation. If you want a fairly firm mattress that comes with a generous test period and a good warranty, then you are likely to appreciate this one from Tuft & Needle. It is priced a bit higher than some other bed in a box type mattresses, but it has an excellent reputation. There are thousands of positive reviews, and many mentions of good responses from the company when needed. Note that many people who prefer slightly softer memory foam mattresses add a topper to this one and find it meets their comfort needs very well. Designed to offer cool comfort, the Zinus 12-inch gel-infused mattress is infused with green tea extract and castor natural seed oil for natural resistance to odor and bacteria. It features an air-flow high density base topped with three distinct layers of memory foam. 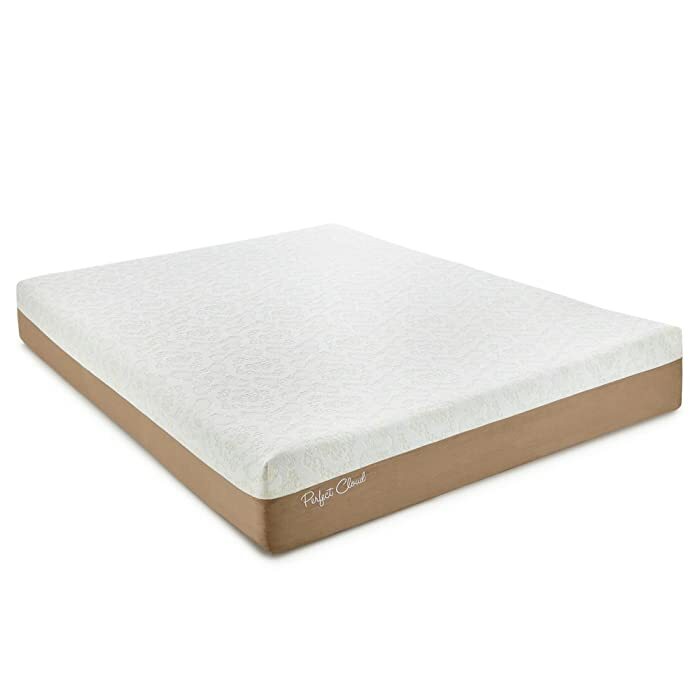 This gel memory foam mattress is hypoallergenic, and is CertiPUR US certified for content, durability, and performance, and takes an average of 48 to 72 hours to decompress before use. If you are looking for a low-cost memory foam mattress, then you may very well appreciate this one from Zinus. Most who have purchased it are highly satisfied, reporting medium-firm support and good-quality sleep. Once, not too long ago, there were only a few memory foam mattress brands to choose from. Today, the options can seem overwhelming. While we’ve gone to great lengths to provide you with several excellent memory foam mattresses from which to choose, there are some important factors to keep in mind as you make your selection. Firmness – If you normally require a firm mattress, you’ll find that most memory foam offers excellent support while still moving with you and providing the restful floating feel that makes these mattresses so popular. Medium density memory foam feels good to most people; those who like soft mattresses often like it just as much as those who need lots of back support. Durability – Be cautious of low-density memory foam; while it may feel comfortable early in its life, it is likely to break down a bit faster than medium- or high-density memory foam. The good news is that the average lifespan of a memory foam mattress is more than five years, even when you go for a low-density model. Heat Retention – If you tend to feel hot when sleeping, then you may wonder how well you’ll do with a memory foam mattress. The good news is that many manufacturers now offer models with cooling technology built-in, preventing the excess heat buildup that can be a problem for those who tend to feel overheated when sleeping. You may want to consider gel-infused memory foam mattresses if you sleep hot, as they tend to be coolest. Type of Foam – Is the mattress you’re considering plant-based or synthetic foam? Plant-based foam tends to be best for people who are sensitive. While they may cost a bit more than synthetic types, plant-based memory foam mattresses tend to emit fewer odors and provide a cooler feel than their petroleum-based counterparts. Your Size – The lighter you are, the lower density the memory foam you need to feel comfortable, particularly if you prefer a mattress with a softer feel. Medium density memory foam feels comfortable to lighter-weight people as well as those who are heavier, making a good compromise for couples who have significant weight differences. A mattress topper can add more cushioning if your mattress feels too firm. Trial Period / Warranty – A mattress is usually a significant investment, so double check to ensure that you’re satisfied with the available trial period and/or warranty before you commit to making a purchase, no matter where you buy! It’s worth remembering that the best memory foam mattress for your needs won’t necessarily be the same as the one that satisfied another person, nor will it always be the most expensive one on the market. By keeping different factors in mind as you shop, you’ll find it easier to make a choice and enjoy deep, comfortable sleep night after night.